The Web Design Source had a really cool contest to see what 10 great designers would do with the same person’s resume. (Note this is an English website, so they’re including some personal info that would be a no-no here in the US, such as birth date and marital status). 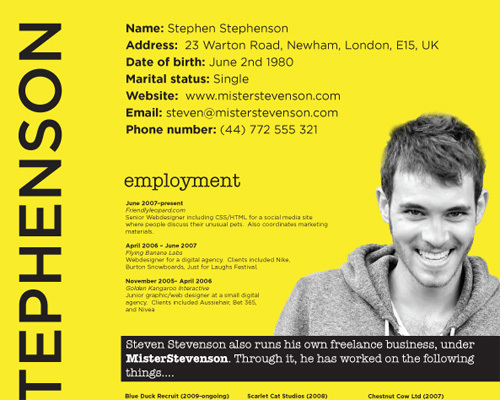 1) Unless Steven has a version in MS Word, or text only, his resume won’t work with applicant tracking systems. This means his data won’t be found 3 months from now when the HR department needs to hire a designer, and scans the database for candidates. 2) The focus of this contest was on visual appeal. The contestants weren’t actually given enough information to write strong content. (You can see the rules here). A strong resume should communicate what makes you different. How are you uniquely valuable? What impact has your design work had on your employers/clients? Has it increased sales? Driven leads? Improved conversion? Unlike most professionals, web designers are able to measure the impact of almost everything they do. A resume that doesn’t communicate that impact is an ineffective one – no matter how pretty it looks. My own advice to web designers is to create a practical, easy-to-read, impact-filled resume in MS Word (here’s an example) and then go a little crazy on a PDF version that demonstrates your design skills. When you apply for a position by email, send both. That way you are sure to make the most of all the opportunities available to you. Check out the rest of the designs here and let me know what you think. 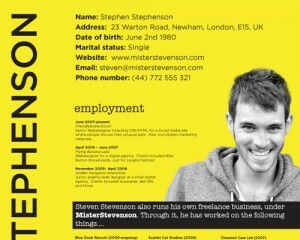 I think that a “designer” needs to design his own resume. I’m likely to make decisions about the quality of his work–as a designer–from his resume, unless, of course, he’s not actually looking for another design job. Visually, I find the yellow one most powerful, but then, it’s easy to have visual appeal when you have…well…visual appeal. At a glance, I might mistake it for a performing arts resume. Very handsome young man, though, who coincidentally shares my birthday, as well as my name, with me. As you point out, there didn’t seem to be much to go on for content, but as an user experience person myself, I think that most of the graphic artists didn’t grasp the importance of the information architecture of the resume: The visual design must follow the structure of the document, and must not overpower the content of the document. The link is broken to The Web Design Source – bummer. 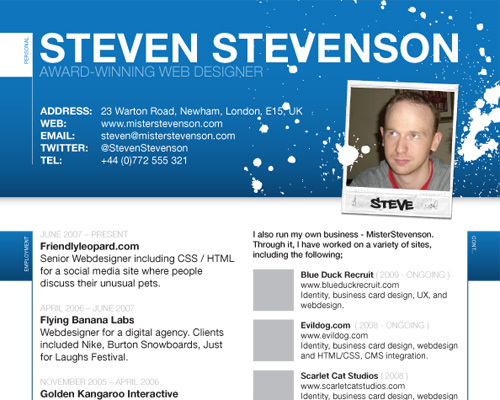 Great points Stephen – that’s often the case with graphic designer resumes that we see. They look beautiful but often at the expense of readability. @405 Club sorry about that. It was working yesterday but their site seems to be down. Hopefully they’ll fix it soon! This is a great snippet. Thanks for the info! The link provided is currently not working but I’ll check it out at a later date. Very good idea – will pass the post onto my brother in law. Web designers should read ” Design is a Job”. The book isn’t what the title suggests. It is a real inspiration to those who do web design.